I saw this quilt over at Modest Michelle and knew I had to have one for myself. Ok not for me, for Hand 2 Help, this H2H quilt #4. I'm making two of these, but daughter #4 claimed H2H #4's twin :) I have it all pieced and ready to go. Actually it's quilted but there wasn't enough natural day light to get a picture. I'll post the finished quilt later in the week. The colors are awful in this picture. I'll try to get a better one when it's completed. Here's some updated pics on the Tumblers - size is 66 x 74, batting hobbs 80/20, pantograph is flipping frawns and thread is glide on top, bottom line on the bottom. And a start on my throw size triangle quilt. I've got 14ish Amy Butler FQs all cut up and ready for my first ever triangle quilt. So excited. Yep I used the accuquilt die for these. I love this triangle die as much as I do the tumbler die. Don't forget to check out the side bar for linky parties throughout the week. Each one is different in it's own way, I love them all!! 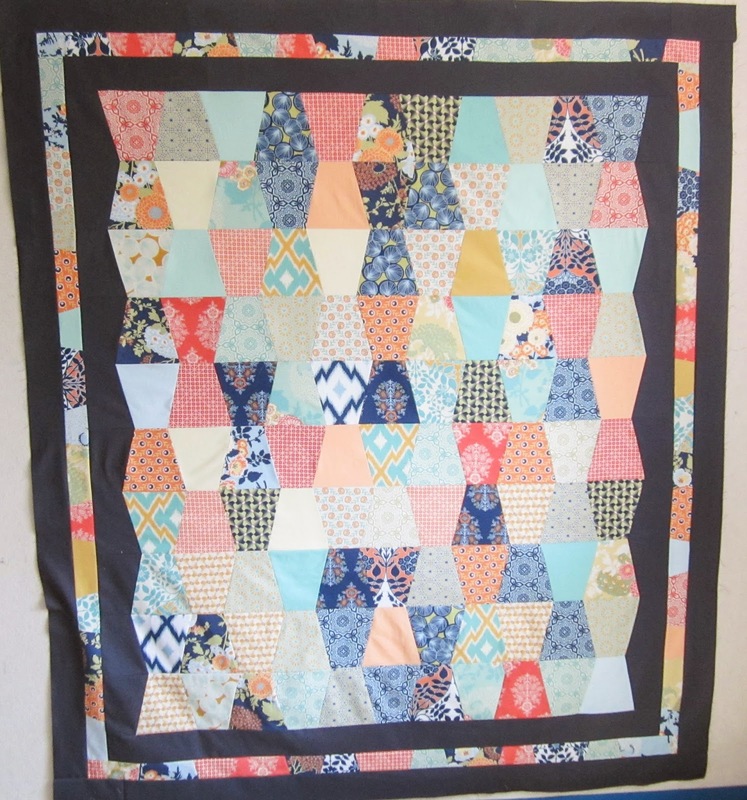 Love the tumbler and Amy Butler is fantastic for a triangle quilt. Your tumbler quilt is great! I am going to have to really consider getting the die cutting system. Your triangles are perfect! Love your colors. What size did your fantastic tumbler und up? Made a couple of the tumbler quilts myself, love the dies. I don't have the triangle die, might need to check that out. very pretty tumber quilt, love that panto. Looks great!!! I could get lost in your quilting. It's captivating and simply stunning. The quilt is lovely, too. Beautiful quilt Sue!! I did a tumbler table runner and it was so much fun! 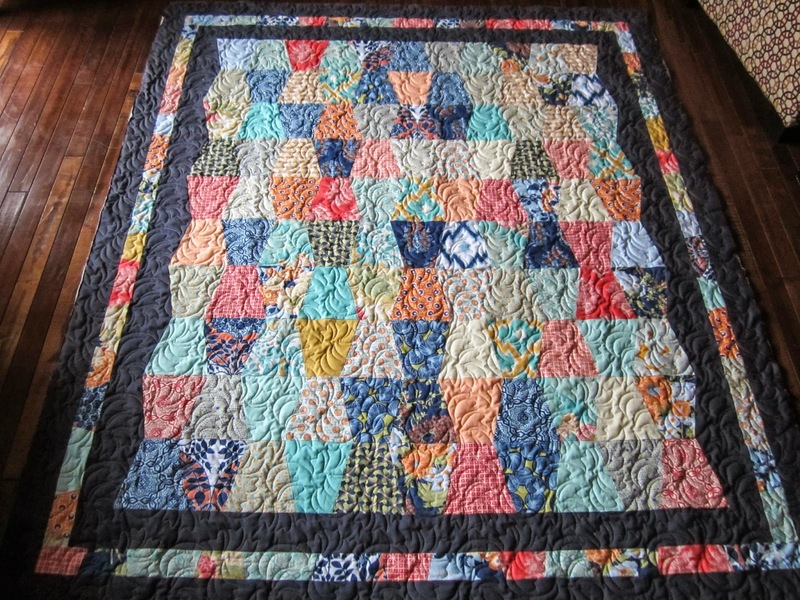 Love your quilting of course :) Thanks for sharing. Looks great, I love the texture that panto gives. LOL!! When I saw your picture on the linky party...I first thought...what Sue's eating cake!! (At a glimpse your stack of tumblers looked like a piece of cake) It must be her birthday! LOL!! That's what I get for reading blogs early in the am. Happy day! Oh another awesome finish!! I love the fabric especially! Those tumblers are lovely, and the quilting is fantastic. 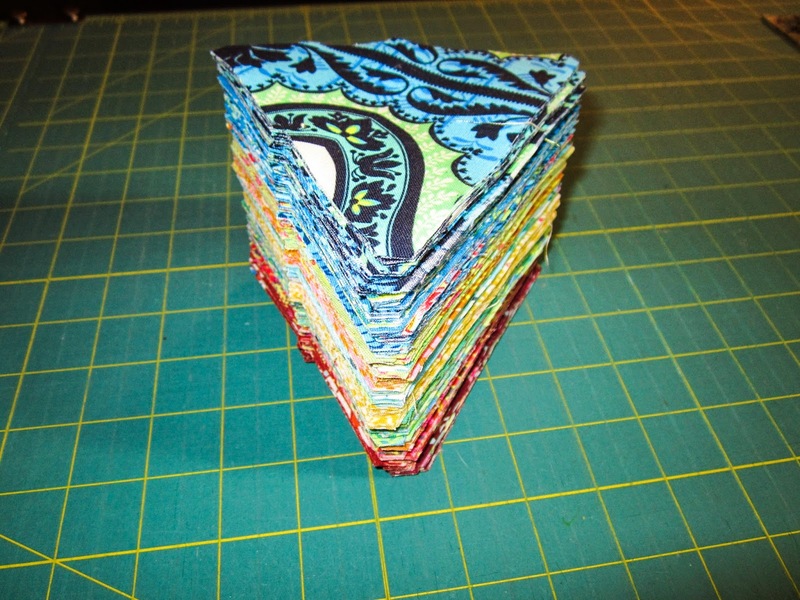 I think you'll really enjoy making a triangle quilt. I just made one myself as part of the #TraingleQAL at The Sassy Quilter. Tumblers are so much fun and your quilting adds such dimension. I wish I had a toy to cut triangle with! 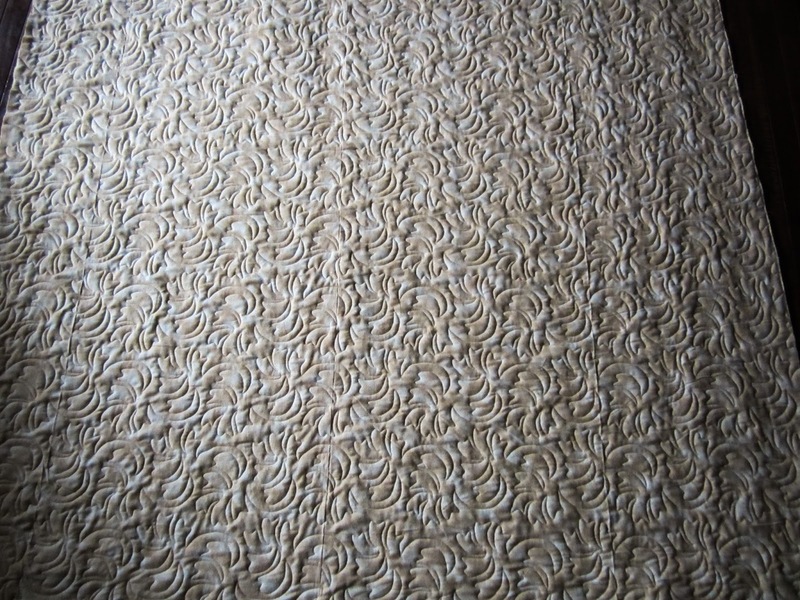 The quilting gives it great texture! Great job! Wow, Sue! 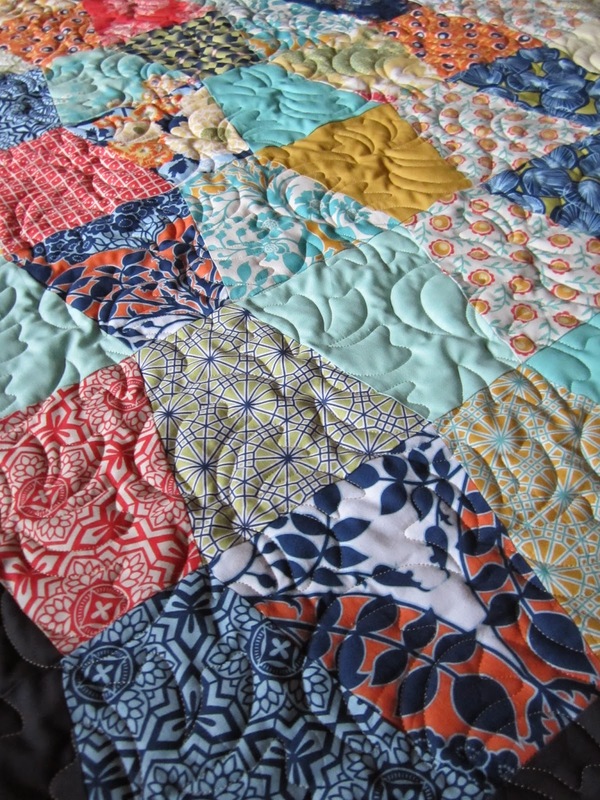 Your quilting is always so pretty. That hobbs must be your fave. It sure does show it off! Can't wait to see those triangles in action. Have fun!